Carbon in our soil is released as greenhouse gas through flooding and change of land use. (Phys.org) —The first comprehensive overview of the world's largest terrestrial pool of carbon highlights the importance of soil carbon conservation in mitigating global climate change. Following an extensive examination of the literature on soil-stored carbon published over the last 60 years a group of researchers from the University of Sussex, University of Cambridge and from Italy have collated estimates of global soil organic carbon stocks. The study, published recently in the journal Carbon Management, draws attention to the extent to which changing the way land is used contributes to rising atmospheric CO2. The study's leader, Dr Jörn Scharlemann, previously at the United Nations Environment Programme World Conservation Monitoring Centre in Cambridge and now Reader in Ecology & Conservation in the School of Life Sciences at the University of Sussex, described his team's findings as a call to arms. He says: "It's really surprising—although the first soil carbon map we found dates back to the 1950s, we probably still know more about the moon than about soil carbon." Accurate knowledge about the quantity of carbon stored in soils is important because the greenhouse gas CO2 is often emitted when land use is changed, either through human activities such as agriculture or natural forces such as flooding. Carbon emissions resulting from changes in land use and land cover are the second largest source of human-caused carbon emissions to the atmosphere after emissions from fossil fuel combustion. To date, however, most policies aimed at reducing CO2 emissions have focused on carbon stored in plants, despite the fact that more carbon is stored in soils than in plants. The majority of carbon stored in the soil is the result of millennia of decomposition of organic matter. Estimates of global organic soil carbon stocks are uncertain, and carbon emissions from land use and land cover change remain the least understood component of the global carbon cycle. 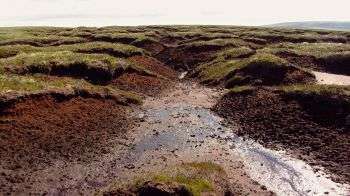 Maps of global carbon distribution show that most soil organic carbon is stored at northern latitudes, with a significant quantity locked up in permafrost regions. As co-author Dr Ed Tanner, of the Department of Plant Sciences, University of Cambridge, explains: "If we're interested in conserving carbon, which we ought to be, we ought to conserve soils in temperate regions, and plants in tropical regions." The accuracy of distributional data for global soil organic carbon stocks is not consistent across the globe, however. While some regions, including China and Europe, have been mapped at a high resolution, the majority of the data comes from coarse resolution soil maps dating back to the 1970s. Furthermore, existing maps usually only provide data on carbon stocks to a depth of 1 m. In parts of the world, however, organic soils can be up to 11 m deep, with the result that these soils contain more organic carbon than is indicated on the distribution maps. Dr Scharlemann says: "Climate change models are currently using soil carbon estimates that vary by an order of magnitude. We're creating scenarios of climate change, and basing decisions on these scenarios, even though the input data are actually really uncertain." The researchers call for existing estimates of global organic carbon stocks to be improved through the collection of more data on soil profiles, sampling soil carbon to greater depths, and the use of standardised sampling and modelling techniques. In recent years, new techniques, such as remote sensing, have become available, which could be used to estimate the amount of organic matter in soils. Policies designed to reduce emissions of carbon have not fully considered the effects of land use and land cover change on soil organic carbon stocks and their emissions, despite significant losses of soil carbon. In some cases, for example, up to 50 per cent of soil organic carbon is lost when native vegetation is converted to cropland. The researchers urge policy and decision makers to recognise the importance of soil organic carbon in the global carbon cycle and in climate change mitigation. "Policy makers need to take soil carbon into account, but to do this they need better information on the total amount of carbon stored in soils and where it's distributed," says Dr Scharlemann. How does soil store CO2?